The Duchess of Sussex let slip the due date of her baby as she met locals in Birkenhead today. Meghan, 37, revealed that she is six months pregnant with her first child expected in April as she chatted to well-wishers in the northwest town of Birkenhead during her and Prince Harry's first joint engagement of the year. 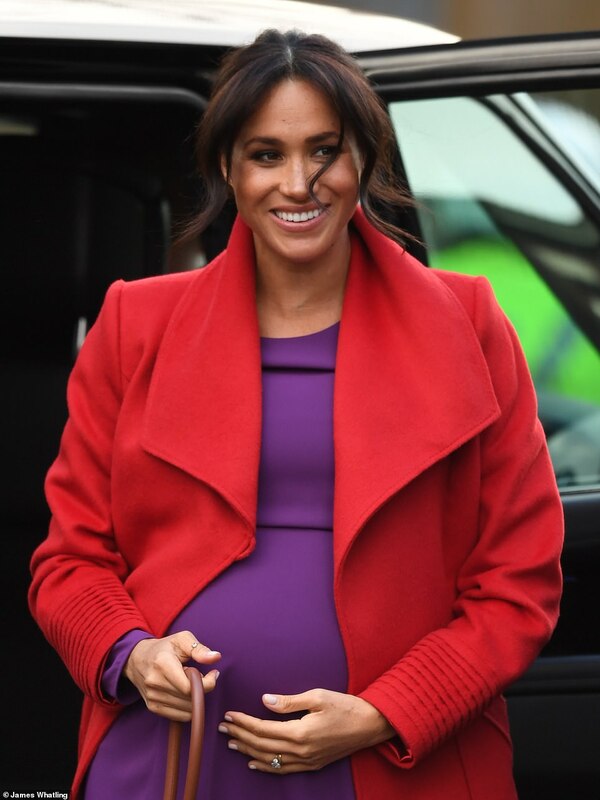 The brief exchange was overheard as Meghan, glowing in a red wrap coat worn over a figure-hugging £107 purple dress from Babaton by Aritizia, met locals in Merseyside with her husband on Monday morning. While Kensington Palace have not publicly revealed the due date, royal fans had previously speculated that Baby Sussex could be expected as early as March due to Meghan's blossoming baby bump. Meghan paired the vibrant ensemble with a £1,695 Gabriela Hearst leather 'bowling' bag and vertiginous red stilettos and, in a return to her signature style, the Duchess ditched the sleek chignon she's been sporting in recent weeks for a relaxed 'messy' bun as she and Harry charmed the locals who had gathered to see them.